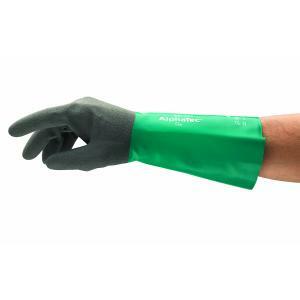 AlphaTec® 58-430 and 58-435 both feature Ansell Grip Technology™ for optimal control when handling oily or wet items. Less force is required on slippery objects, reducing hand and arm fatigue. Both models offer improved flexibility and dexterity thanks to a cotton-flocked lined nitrile shell and snug, second-skin tailoring that tightens the fit across the palm. The medium-duty 58-430 features a 10-mil shell to protect against exposure to bases, oils, fuels, some solvents, greases and animal fats. The heavy-duty 58-435 has a 16-mil shell effective against hydrocarbon derivatives, alcohol bases, many solvents and esters. The nitrile coating offers superior snag, puncture and abrasion protection for long-term wear. A foldable gutter cuff helps prevent dripping onto the forearm, while an extra-long cuff (58-435) extends protection to the upper forearm.